Gas prices shot up right across the country overnight, with some stations in Vancouver reaching $1.28 a litre while pumps hit $1.13 in Halifax. Montreal motorists saw prices reach $1.18 on Tuesday, while Calgary residents saw prices increase by nine cents overnight to around $1.08. Across the Greater Toronto Area, the cost of gasoline climbed to $1.08 a litre, up from about $1.05 on Monday. In Ottawa, prices at the pumps also rose three cents a litre to just under $1.10. Liberal MP Dan McTeague, the consumer affairs critic and longtime critic of the oil industry, says prices have soared to the highest levels since Hurricane Katrina. Boris Yeltsin is dead. Many, I think, were surprised he was still alive. 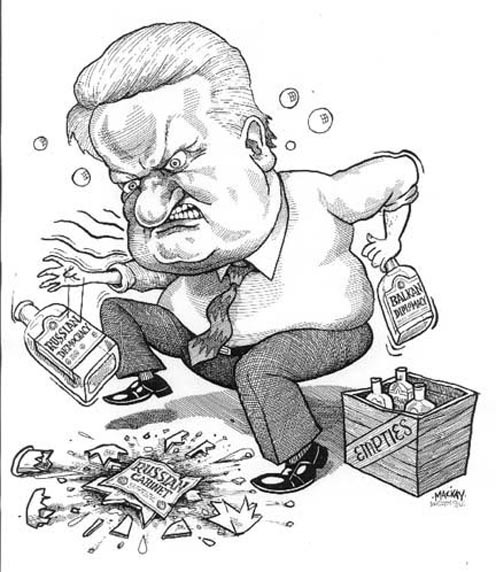 Perhaps he was pickled by the constant flow of alcohol he evidently consumed midway through his Presidency of Russia towards the end of his retirement. Who knows? The fact is after he handed the Kremlin keys over to Vladimir Putin in 2000 he never really resurfaced in the public limelight again, becoming largely forgotten. Of course there must be credit given to the man who began his rise to stardom by toppling a Communist coup designed to reverse the democratic reforms initiated by Mikhail Gorbachev. While he will undoubtedly go down in history for liberating Soviet citizens, he may be better remembered in the old “free world” for his trashing the old USSR, and thereby ending any remnants left from the cold war years. He oversaw the disintegration of the old Soviet Union and became Russia’s first democratically elected leader. Then he tried to bring in goofy economic policies which only empowered corrupt oligarchs and angered legislators, and when things didn’t go his way he brought back old style Soviet tactics to deal with dissent and ethnic unrest. Blasting the Parliament buildings with cannon fire isn’t exactly the most democratic way to debate things with opponents, although Yeltsin seemed to think it was, and he got away with it. He also got away with pinching the bums of women politicians and bureaucrats; hamming for the cameras while visiting Berlin and by grabbing a conductors baton and leading an orchestra; playing the spoons on the head of Askar Akayev, the president of Kyrgyzstan; and staggering around in his underpants shouting for pizza in the hotel room during his first summit meeting with Bill Clinton. Well, this cartoon might have had the shortest shelf life on record. This morning the Liberals launched its Green Plan. Anyway, this is the first St. Patrick’s Day editorial cartoon I’ve ever drawn. With all the talk of green this and green that over the past 3 or 4 months I’ve been waiting for the arrival of this day to feature some politician dressed up as a leprechaun. This is the second time within 6 months… the last (and probably first ever leprechaun I’ve drawn since probably grade 4) was in this cartoon related to Toronto’s Simcoe Day. Many people think that because I’ve got a pretty celtic name… my middle name is Patrick, by the way, I’m one of those Celtic-philes. Especially one of those North American ‘celts’ who try hard to understand their heritage by scoffing at the notion of green beer and acting like they really enjoy stout beer… and not necessarily Guiness, but one of those micro brewed Irish stouts. Scottish wannabes will act like haggis is the greatest delicacy on Earth. And of course extreme Celtic-philes will listen to obscure celtic music and set aside time on Saturday mornings to watch television highlights of British and Irish soccer… I mean, football. Every few years they’ll go over to the old country and wander around cemetaries looking for long lost relatives just to assure themselves that their backgrounds go beyond their large suburban garage doors in Blandville, North America. I’ve been to both Scotland and Ireland on a couple of occasions. I lived in London for nearly two years in the 1990’s. I was one of those Celtic-philes, and my life in the U.K. gave me enough exposure to the ways of life over there that I’m more than happy to be back here. I think it was the aftermath of downing 7 pints of Guiness in a row at that St Patrick’s night party at the Irish Club in Sloane Square 14 years ago when I realized Celticmania wasn’t all the ‘craic’ I had been lead to believe. My grandfather, the MacKay one, emigrated to Canada from Scotland in 1885. That’s 1885. He’d be 129 if he were still alive. Needless to say I’m pretty far removed from the Celtic world. So if we ever bump into each other in person don’t be surprised when you don’t see me in a gaelic kilt and speaking with a heavy Scottish brogue. A chorus of opinion writers emerged over the weekend to celebrate the Supreme Court of Canada in its decision to declare government issued security certificates against suspected terrorists as unconstitutional. Now some rather local activist minded folk irritated by my cartoon are checking in to tell me how much of a fascist monster I am to swim against the river of support for the Supreme Court’s decision. To them I let it be known that that’s supposed to be the job of the editorial cartoonist — to go against the conventional wisdom of the eggheads in country, whether they’re politicians or supreme court judges. This cartoon is to remind the reader that while it may be by all appearances an indictment against government curtailing the rights of a few dubious individuals for the safety of the majority there remains a threat that at anytime in the future this country will endure the horror of a terrorist act. We are, afterall, fighting them with bullets half a world away in Afghanistan. But then the accusation is made that the depiction of these terrorists using the Canadian Charter of Rights and Freedoms as a plaything paints me, the cartoonist, as a racist, implying that all Muslims are terrorists. It reminds me of the time I drew Martha Stewart being harassed at the US/Canadian border as terrorists were breezing in without difficulty. Same accusation was made in letters posted alongside the Martha Stewart cartoon. Should the terrorists be shown wearing suits, or baseball caps on backwards? Everybody knows what the stereotypical terrorist in 2007 looks like, and they resemble the very people you see in today’s cartoon. So Timothy McVeigh and Terry Nichols build a terrorist bomb carrying vehicle, blow up a large building in a downtown American City, kill 165 people including men, women and children and as full scale professional terroists, get a full trial, full access to the US Bill of Rights, benefit of the doubt, aggressive lawyers, full disclosure of the government’s case, as does every IRA terrorist that tried to kill people in downtown London and every Basque separatist that blows up trains. These are all nice white people, McVeigh a veteran of the US armed forces, they do not wear beards or funny hats. It is obvious that in your world, the absence of beards and non-european headwear makes the big difference for the white folks who, with no real public complaint get full protection when the state takes after them. Even when the white guy without the beard and head gear is a pig farmer who is charged with killing bunches of females and feeding them to pigs, we still make sure he has the benefit of the doubt and disclosure and a lawyer and a fair trial. But the Mackay message is that Beards and Headgear and Mulsim identity get you ridiculed and we are urged by you to think those bearded, headgeared, muslims should not get the benefit of our Charter of Rights, and by inference that the Charter of Rights is something to joke about. Its hard to imagine a more racist, destructive, mean spirited message than that in your comment on the Supreme Court of Canada decision. But instead of my words about why you should be really proud to be part of a country that treats its most despicable, feared or evil people with a guaranteed set of rules of fairness and honesty developed over 800 years, I hope you will consider for a moment what an experienced US soldier, Lt. Cmdr Charles Swift, has to say about dispensing with the rules. If you really believe that our Charter should be mocked in the fashion of your cartoon, there are wonderful countries in this world without a charter and without an independent supreme court. I would be happy to give you a list of places you might consider that would be more in harmony with your views. Given the power of the internet you could easily continue you work by email, so the move could be done with no loss of income. And often the cost of living might be less than here. Although I really doubt you would move to any such place. Thank you for your thoughts. Fortunately, we Canadians are free to express our opinions and I know we won’t see eye to eye on this matter. I just don’t agree that the Supreme Court did any good to protect the collective interest of Canadians in its decision to protect the rights of a few dubious characters. I also don’t agree with Parliament’s rejection of extending the anti-terrorism provisions. Especially… and this is what so many naive Canadians and Liberals are casually ignoring… when we happen to be at war with terrorists half a world away in Afghanistan. To not have these safeguards in place at such a potentially dangerous time is reckless. If it doesn’t raise the possibility of enduring a Madrid, London, or Bali styled attack, we’ll just become more of a safehouse for terrorist cells planning its assaults on our allies. If you think having to get a passport is such a huge inconvenience for getting into the U.S. now, imagine how inconvenient it’s going to become as we laugh off America’s post 9-11 paranoia with flimsy anti-terrorism laws. As for the cartoon, the terrorists we’re fighting don’t happen to be nice white guys with Irish or midwestern American accents, but guys wearing turbans and army fatigues. So, if you want to call me racist for drawing the terrorists the way I did you might as well call all the soldiers fighting the Taliban and Al Qaida racists as well. How you conclude that I’ve painted all Muslims as terrorists is groundless and unfair. But it’s not like I’ve heard that one before. While I appreciate getting your feedback on cartoons I think you could be getting much wider coverage by sending it on to the letters editor. Put it on the record, because the moment a bomb goes off in downtown Toronto or Montreal in the name of Islamic extremism I assure you, you’ll be eating your words. * * * * * * * * * *In dedication to Mr. Turkstra and his ilk, I thought I’d draw another cartoon on the issue. See a related blog entry on ad parodies, otherwise known as wackys, which inspired this cartoon. Someone who runs the Dymaxion World blog writes a lengthy analysis piece critiquing my terrorists bouncing on the Charter of Rights cartoon filled with “racism and authoritarianism”. He thinks I’m a right wing propagandist and he uses the same argument Herman makes by suggesting I’m racist for portraying all terrorists as bearded guys with turbans. He adds the FLQ to the list of white guy terror groups which is a nice bit of trivia, but really doesn’t apply to things going on in 2007 despite how lengthy he rambles on about it. The Cartoon represents the opinions of many Canadians (that our security is being neglected for the sake of “rights”). Sure, it could be seen as propaganda, or it can be seen as a reflection of some individuals opinions. Whether we agree or not does not change the fact that such a sentiment exists. If someone wants to ascribe an opinion to me based on a cartoon expressing the artist’s opinion (which isn’t supported in any way by my opinion written below), they can feel free. Hi Graeme: This showed up quite unexpectedly on my screen today and I couldn`t resist a comment. Since then we`ve learned particularly in the last year that the terrorists look exactly like us, a lesson we should have learned when the graduates of Waterloo University blew up power lines in British Columbia two decades ago. And one can argue that Henry Kissinger in Cambodia or Cheney in Iraq or the President of Israel in Gaza were terrorists who looked remarkably like you and me. So I wondered if you still think that terrorists all have turbans? OK OK, I understand you have to deal in stereo types, but my ilk keep battling those stereotypes because they generally lead us down the wrong path, IMHO. Things haven’t changed much in my mind since the above cartoons were drawn. I’m certainly disappointed with how events have transpired in Afghanistan since early 2007 – the failure to effectively root out the Taliban from keys areas, the failure to advance democracy in Afghanistan with legitimate elections, and a willingness to accept bribes from insurgents and warlords to enable mobility. Sure, you can call the white guys that ran the U.S. during the Vietnam war, or Cheney during the Iraq war are terrorists as much as you can call Barack Obama a black guy who is arguably a terrorist. I guess there’s different degrees of terrorists. A white guy that blows up power lines in B.C. is a bit different than people convicted of successfully/planning on blowing up and killing random innocent people. There are really only one kind of people who are carrying out those acts in this day and age in the post 911 era, and they all happen to be doing their killing in the name of one certain religion, and one certain god. I received word today that this cartoon won a Ranan Lurie Citation for Excellence Award from the United Nation’s Correspondence Association. Quite a mouthful, but a great honour to be lumped among some of the world’s best editorial cartoonists. I never win anything… so this is very nice. 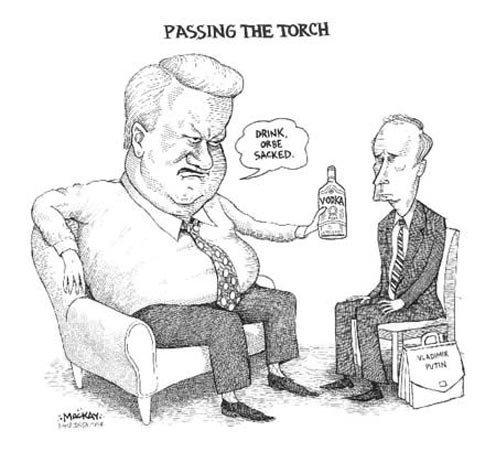 Spectator editorial cartoonist Graeme MacKay has been honoured for political satire by the United Nations Correspondents Association. MacKay, whose works have pricked Spectator readers’ consciences and often tickled their funny bones for 10 years, has been chosen one of the association’s 2006 winners of the prestigious Ranan Lurie Political Cartooning Award. MacKay, the only Canadian in the international winners’ circle, was awarded a citation of excellence for his entry. First place went to Alfredo Sabat of La Nacion in Argentina. Cartoonists from the U.S., France, Australia, Brazil, Greece and China were honoured. “It’s great to be in the company of these guys,” MacKay said. “We’re really lucky to have Graeme here with us,” said Spectator Opinions Editor Kevin Cavanagh. “When it comes to opinion, writers might have a whole column to make their points but it is entirely different for a visual satirist,” said Cavanagh.